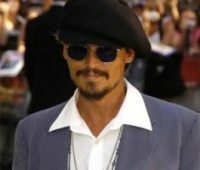 ‘Public Enemies’ star Johnny Depp doesn’t want his two children to follow in his footsteps and pursue a career in Hollywood. Johnny Depp’s “greatest fear” is his children becoming actors. The ‘Public Enemies’ star – who has 10-year-old daughter Lily-Rose and Jack, seven, with French singer Vanessa Paradis – is worried his children’s interest in his career will see them follow in his Hollywood footsteps. Johnny says his family is the most important thing in his life and he is more interested in pleasing them than winning acting awards.